Path Application Property in VBA is used to get the complete path to the application or workbook. It excludes the final separator and name of the application. 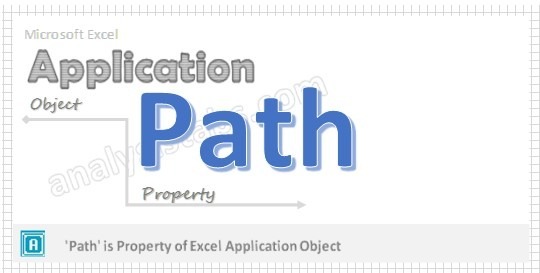 Please find the more details about path property of application object in the following section. Here syntax for Path Property of application object in VBA. In the above syntax Application represents object and Path is the Property of Application object. Please find the below example for Path Property of application object in excel VBA. The below example displays the complete path of the application in Excel window. Please find the below example it will give the complete path of the workbook or application. Step 6: The above macro or code displays the application path in the message box window.